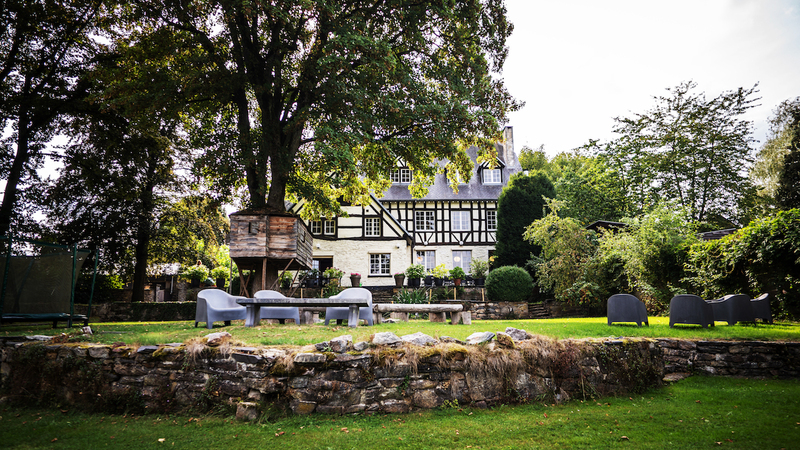 Domaine des Officiers is located in the heart of the town of Vielsalm in the Belgian Ardennes. This accommodation caters to groups up to fifty people. Unique in its kind. This spacious location consists of several buildings, a courtyard and a large outdoor area. The estate can only be booked in its entirety. You will never find any other guests on the premise apart from your own. And once in, the privacy of your group is guaranteed. Each of the twenty-four elegantly decorated bedrooms is fitted with an en-suite bathroom. This makes the Domaine the perfect place for large groups. And not just for friends and family. For business events too. The estate offers plenty of room for all kinds of activities. Both indoor and out. For all ages. From playing on the trampoline in the garden to visiting a seminar in one of the common areas. You are the director of your own stay. Business training sessions, team-building events, courses or a day out. 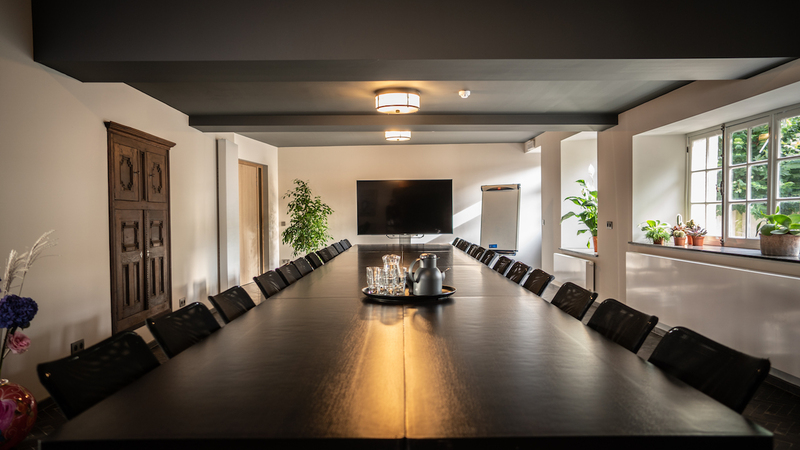 Domaine des Officiers is perfect for business events. You are in complete control of organising your gathering. Your company or organisation takes charge in organising your stay. And of course we are here to help ensure all your wishes are met. Both on the premise itself and in the surrounding area. Options include catered workshops, outdoor activities and lunches on-site. 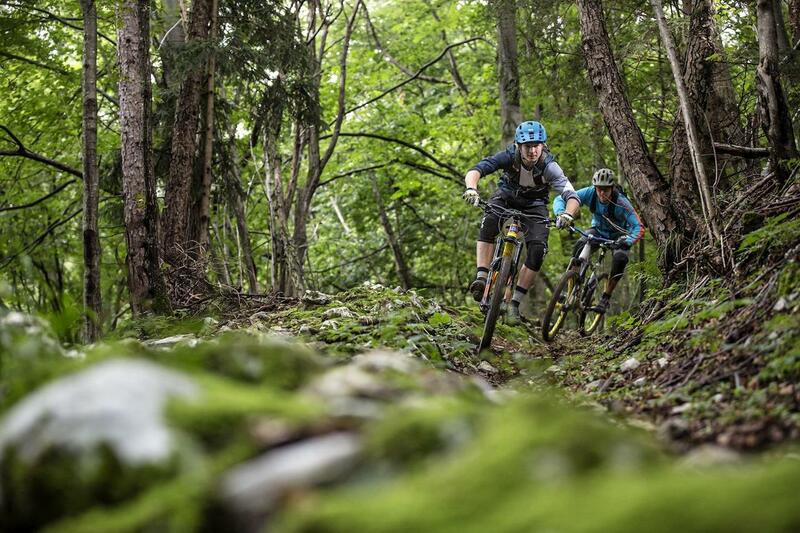 The heart of the Ardennes is famous for all its outdoor activities. But there is also a lot to taste. Domaine des Officiers boasts a professional kitchen. Which is accessible to guests. But if you don’t feel like cooking, you can always have the accommodation catered. And if you don’t feel like staying in, the area surrounding the gates of the Domaine offers plenty of culinary options. 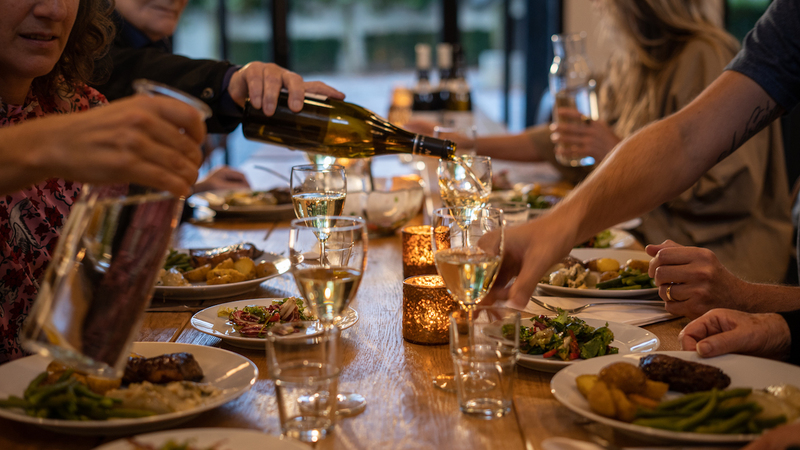 You will find a list of restaurants at https://www.haute-ardenne.be/nl/te-doen/eten/restaurants . The Domaine is located in the heart of the Ardennes. Gorgeously situated between the rock formations, woods and hills. The area offers a lot of outdoor activities. This makes Domaine des Officiers a perfect weekend or midweek getaway both in a business and a private context. And nature is always at your doorstep. This allows groups to exert themselves in the outdoors and then come home to the Domaine to relax. 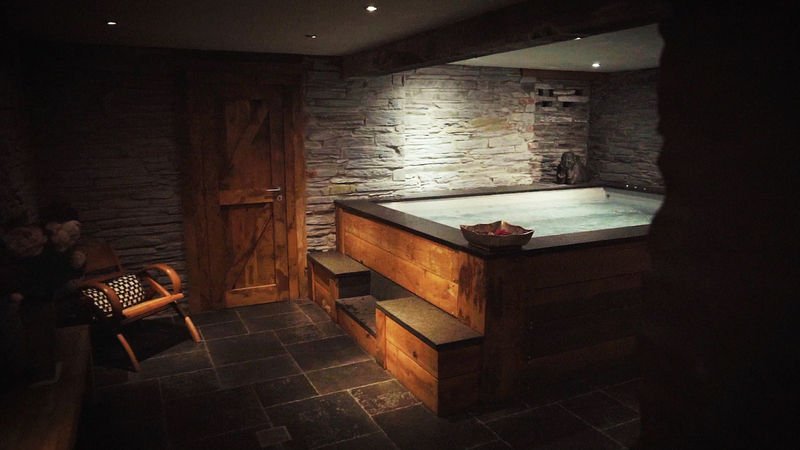 For example in the luxurious private spa with spacious jacuzzi, sauna, showers, massage and relaxation room. 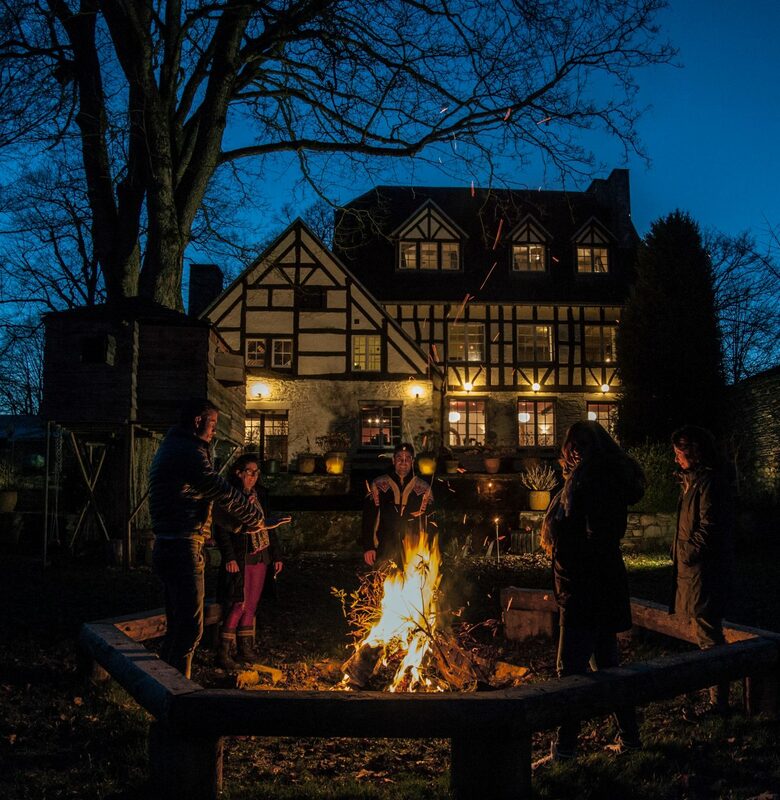 To perfectly balance your stay in the Ardennes. Various workshops can be organised on-site. Workshops about mindfulness, breathing and yoga are currently very popular. The accommodation caters to exercise as well as relaxation, physically and mentally. The Domaine des Officiers estate spans 3 hectares. The Domaine boasts several buildings. The main building, the gate building and an annex. There’s also a courtyard, a tennis court, a recreation room, plenty of parking space and fireplaces. And a huge garden with a terrace. Guests are becoming increasingly creative in spending their time at the Domaine. Meaningful, humorous, creative, playful or with a workshop. We have a wealth of experience in this area. And even those who love to play a game of tennis or get a massage at the spa are taken care of. The Domaine has it all. Below you will find a list of the most popular workshops and options for relaxing on-site. Cocktail bar, Yoga classes, Breathing coaches, Cooking classes, Cooking workshops, Boxing workshops, Mindfulness workshops, Spa, Massages, BBQ facilities, Tennis. The direct surroundings in the heart of the Ardennes make for a direct invitation to get out there on a daily basis. This can be individual and improvised. But those who want to get the most out of their stay, have the opportunity to go about it in a systematic fashion. Below you will find a list of active and relaxing activities. Foraging, GPS orientation hike, Kayaking, Outdoor hexathlon, Expedition of elements, Hiking, Horseback riding, Driving a scooter, Mountainbiking, Fishing, Running, Team building, Swimming, Beer museum, 1st and 2nd world war museums, Chocolate museum, Beer brewery, Slate mine museum, Cloister, Abseiling, Picnic on-site, The Thermes of Spa, Spa /Francorchamps circuit, Coo waterfalls, Farmer’s golf, Laser tag, Skiing and cross-country skiing, Paintball, Tree top track.